The media is once again pouncing on the news about the upcoming big switch from Muni paper passes to Clipper only passes. The media will do their usual crap, say it's some kind of panic, then a few days later, no news. Soon after, they'll say thousands don't have the Clipper card, while the truth is, people have been forewarned for many months the big day will come. 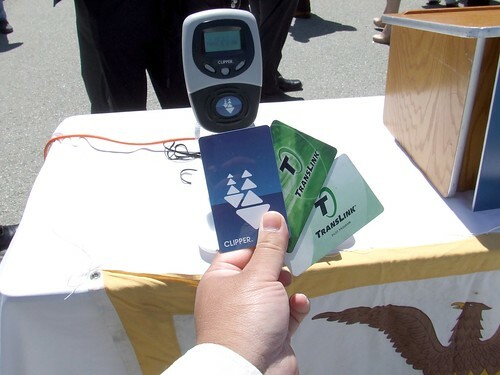 Some bright news, all Muni pass retailers will sell Clipper cards with the adult "A" pass pre-loaded on the card. However... they won't sell the cards again, which reminds people, find another vendor or automated machine to handle purchasing December's pass. "The complaints about language outreach are hilarious. Every other major metropolitan area uses a transit card similar to this, from London to NYC and there are never "language issues". The only reason people are complaining is now they wont be able to use ( and not pay for ) fake passes and get away with freebies under the guise of "cultural insensitivity" PC baloney." Hmmm, makes me wonder how many people have fake fast passes and now realize that there's no way to fake an electronic fare card? Stop stealing from Muni and PAY UP. Part of the language issue is not that users are unaware of Clipper, but rather miscommunication and how it works. I have informed at least a dozen or so older Chinese locals living in Richmond and Sunset districts on the 16, 71, 38, and N that the Clipper card has automatic electronic transfer. These people were under the impression that with Clipper, the benefit of a transfer would be eliminated because the driver no longer issues a paper one. I have seen ads in multiple languages in print, TV, and radio, but these really only make users aware of the Clipper and that it works on multiple transit agencies. They don't go into details such as transfers and such.